Many a long and tiring journey begins or ends in this huge, cavernous hall. Rows and rows of seats, endless platforms and big electronic boards with train numbers, train names and destinations. Trains to and from Jaipur, Delhi, Kolkatta, Mumbai; just about anywhere in India. A 2,000 kilometre plus, 34 hour late-night journey departure on the Tamil Nadu Express to Delhi, or the once a week 24-hour long direct journey to Vasco De Gama in Goa: whether it’s a case or coming or going, Chennai’s Central Station is where new beginnings start and where hope prevails. 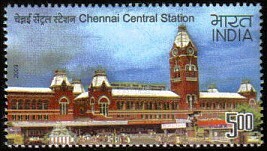 Chennai Central is a building that plays host to the aspirations of the transient masses. It’s the main gateway to elsewhere for this sprawling metropolitan area of seven million plus inhabitants. It’s the building to head for to start out for far flung destinations, for new horizons. Despite the building’s red-brick, Victorian-era façade with landmark clock tower, Chennai Central is pure Indian, pure Tamil. Its eateries offer dosas, idlis, ‘pure veg’ rice meals, helpings of sambar gravy and delicious kesarai or rasamalai for those with a sweet tooth. 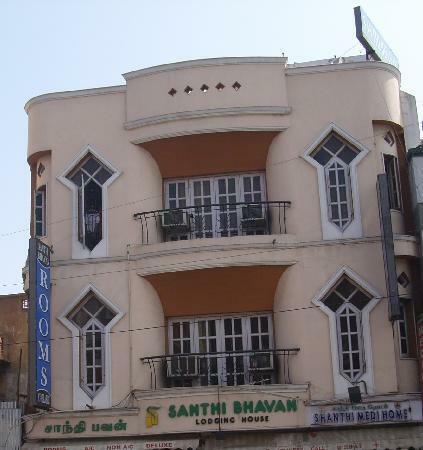 And long-standing icons of Chennai are firmly rooted, from the Higganbothams bookstore to the Saravanah Bhavan restaurant branch. Sinewy men, turbaned heads and dressed in red. They carry heavy loads. These ‘coolies’ or porters are made from granite. In any big station in India, they can be seen carrying massive loads on head for passengers along platforms and up and down bridges to get to other platforms, often in searing heat. And many are by no means young. No bulging biceps, but strong, solid men of ligament and sinew, of iron and steel, of dependability. In the main station building itself, in the modern multi-storey building to the left and in the imperious, magnificent domed grey British era building to the right, a hundred dimly lit rooms house officials. A world of dusty computer screens, wooden desks, clipboards, filing cabinets, electronic rail maps, endless wall charts and stern-looking men. This is a place of bureaucracy and rigid hierarchy, of conformity and rules. And it’s what helps Indian Railways tick. And tick it must and does because many of its trains carry up to two thousand people, all requiring seats, berths, bedding, food, water and punctuality. Despite some long-haul trains possibly running ten hours late, passengers are more or less guaranteed all of the above, including a certain degree of punctuality. In unreserved coaches, people sleep on dirty floors, hard dusty benches or in overhead luggage racks. Then there are the reserved sleeper coaches and ‘pantry’ coaches, where food is cooked and served. Indian trains are cities in transit. By international standards, these trains are painfully slow. Even ‘express’ trains reach up to 140 km per hour and only, given the long stops at stations or in between, average 50 km per hour over the duration of the journey. But the system works, and it works pretty well, given the overburdened infrastructure and the millions needing to transported every day and night. But outside, beyond the world of Indian Railways, another world beckons. Along the adjacent Walltax Road, which runs parallel to the tracks, numerous hotels of the dark and dingy fleapit variety offer a bed for the night. The delights on offer in these self-proclaimed ‘deluxe’ lodges and hotels include deluxe stained bedding, deluxe dubious standards of cleanliness and small reception areas with pot-bellied men lounging around on deluxe musty, beg-bug sofas in off-white vests and lunghis. Others are a little more modern, even one or two are quite decent, but they are certainly not the best that Chennai has to offer. From flophouses to not-so-flophouse, they can all be found along Walltax Road. The ‘wall’ in the title refers to a protective wall that the British built in the 1700s. And the tax refers to a tax that was intended to be collected (but never was) for the road that ran adjacent to the wall. Walltax Road, with its lodges, ‘parcel services’, travel agents, fax and photocopy shops, electronics stores and assortment of other outlets is certainly nothing to write home about. Walltax Road with its basic eateries of Formica-covered wooden tables, banana leaf meals, metal water mugs and garlanded pictures of Hindu gods. Before functionality set in, it was Chennai’s entertainment hub in pre-independence India, housing three theatres, the last one of which closed in 2007. But during the night, it still gives the impression that this could well be an entertainment hot spot, if only because of the neon lit hotel signs. But it is not. Apart from a few seedy male only populated hotel bars, night time on Walltax Road flatters to deceive and the darkness attempts to hide the poor who sleep close to roadside muddy pools or garbage. Darkness has a habit of ‘beautifying’ urban India by masking the muck and squalor. 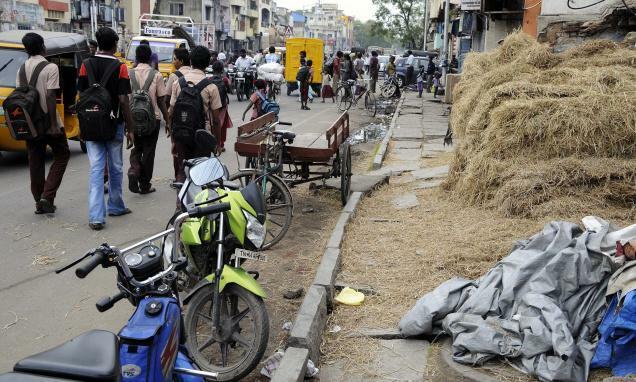 This is a typical road that you might find next to rail stations throughout India. Lined with solid looking buildings, bamboo cutters and hawkers near the station end, this is an arterial thoroughfare that gets you from one part of the city to another. And yet, despite the functionalty, Walltax Road actually provides a hint of much more intriguing things that lie down its chaotic side streets and lanes. On the road itself, cycle rickshaws fly by, trucks are parked up and sacks and boxes are delivered to a number of wholesale outlets. These activities of Chennai’s most interesting area spill onto Walltax Road. Just head down one of its lanes and you enter Sowcarpet and the wider Georgetown location. Walltax Road itself may well be a rather mundane affair, but its many side streets will take you into little Gujarat, little Rajasthan and what can is essentially a taste of North India on South India’s Coromandel Coast. It’s where migrants from the north settled and made the area their own. If you never veer off Walltax Road, you will never know what you are missing. Between it and the coast a few kilometres or more away, there is Georgetown, the city’s traditional heart. But immediately between it and the hub of Georgetownlies Sowcarpet (loosely translated from Hindi as ‘moneylender’: pawnbrokers and moneylenders from North India set up shop here originally). Venture off Walltax Road and you venture into Sowcarpet. And, if you do, you might just fall in love with it. But believe me, it’s not an easy area to love. It’s harsh, congested, muddy, polluted and one look at the area might be enough to send many a faint-hearted soul packing on the next train out. Have no doubt about that. But Sowcarpet rocks… to a constant, intense and heavy beat. This is a jam-packed residential area, jam-packed with commercial enterprises too. There is a lovely painted church on Walltax Road, but move further into the side streets and you will discover numerous Hindu and Jain temples. A couple of Jain Temples on Mint Street, which runs parallel to Walltax Road and constitutes Sowcapet’s main thoroughfare, are a profusion of marble, intricate carvings and architectural splendour. They stick out like proverbial sore thumbs, but in a truly positive way.